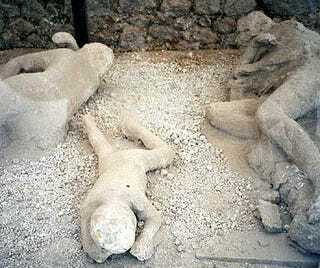 How did the victims of the Plinean Eruption of Vesuvius die? Even at the the far edge of the mud and ash that came from the Pompeii volcano's explosion, the heat was sufficient to instantly kill everyone, even those inside their homes. And that is how the people at Pompeii, whose remains were found trapped and partly preserved within ghostly body-shaped tombs within that pyroclastic flow, died. They did not suffocate. They did not get blown apart by force. They did not die of gas poisoning. They simply cooked. Instantly. That is the conclusion of a study just published in PLoS ONE by Giuseppe Mastrolorenzo, Pierpaolo Petrone, Lucia Pappalardo and Fabio Guarino, entitled Lethal Thermal Impact at Periphery of Pyroclastic Surges: Evidences at Pompeii. This research was carried out specifically to address the question of survivability of certain kinds of volcanic eruptions. When this type of volcano explodes, a mixture of hot gas and fine ash flow at very high speed outwards and down slope, causing widespread devastation. It is generally assumed that people would not survive within the pyroclastic flow zone, but the question remained open as to whether people would survive at the outermost edge, where they may not be impacted directly by the flow itself. ... the evaluation of PDCs (pyroclastic flow) effects near the flow termination is widely debated being crucial for risk mitigation management, particularly for distal areas often densely inhabited. Nevertheless, these aspects are documented only in a few modern eruptions and difficult to retrieve from historical record, due to scarce availability of data on thin distal layers. And thus, Pompeii becomes an important data point. At Pompeii, the remains of hundreds of individuals were found in the pyroclastic deposits from the famous 79 AD eruption, the one documented by Pliny the Younger and memorialized in countless books, a few movies, and a museum exhibit or two. The 79 AD Vesuvius eruption generated a sequence of six distinctive pyroclastic surges (S1 to S6) and flows with increasing power, which caused landscape modification as well widespread building collapse and fatalities . The resulting ash deposits have thicknesses ranging from tens of metres near the vent to few millimetres at the flow periphery. In particular, the early three surges (S1 to S3) stopped ahead the northwestern walls of Pompeii, while the later ones (S4 to S6) over passed the town. The last two surges traveled up to a distance even exceeding 15 kilometres from the vent, whereas the S4 surge deposit least traces are confined within a few hundred of metres next to the south and southeastern walls. The S4 surge, which deposited only a small blanketing of ash at the site, probably caused most of the fatalities in Pompeii. The 3 cm or so thick layer of ash was "emplaced suddenly in a single depositional event resulting from dusty gas mixture deflation in response to horizontal velocity and turbulence dumping at the flow termination." In other words, it was like "phooofff" and everybody was dead and this dusting of ash was everywhere. And I don't really mean to be flip about this ... it is hard to imagine what is being described by this analysis in real terms. Consider this: Imagine an area about 10 kilometers (just over 6 miles) around the volcano. Now imagine that area being covered with a blanket of very hot ashy air over the course of about 3 minutes. To help imagine this, pretend you are looking at the volcano when the explosion starts, and there is an airliner over the volcano heading for you at the same time. It is moving at top speed for such an aircraft, and when it reached you it has slowed to just over 100 mph. That represents the leading edge of the blanket of hot air and ash. Just at that moment, the blanket of air and ash deflates/dissipates, the air cooling and the ash settling. But first, all humans, probably all tetrapods (birds, mammals, etc) within that few miles of space have simply dropped dead. Since there is only a little ash, they are dirtied by it, but later, a larger deposit of ash is spewed out, and now all the dead are deeply buried. Or at least, that's what I'm getting from this paper, more or less. ... most of the victims are typically frozen in suspended actions (73% life-like stance, 27% sleep-like stance), showing as well as limb contraction (76%) and a large number of corpses presenting the pugilistic attitude (64%). That "pugilistic attitude" bit is the appearance that the victim was fighting for his or life, but which actually occurs as a side effect of being cooked very quickly (or drying out more slowly in some cases). Everyone was killed and their bodies frozen in the position they were in at that time of instant death, plus a small bit of involuntary perimortem spasm. They were not suffocated, they were not killed by being blasted with an explosive force that knocked them down. They were cooked in situ. Finally, contrary to previous hypotheses, our findings based on the interdisciplinary volcanological and bio-anthropological study of the deposits and victims of the 79 AD Plinian eruption reveal that even at the extreme periphery of the S4 surge neither asphyxia nor impact force but heat caused the deaths. Actually, while impact force and exposure time to dusty gas dropped below lethal conditions, the pyroclastic cloud retained its high temperature thus being the main cause of instantaneous mortality for the Vesuvius area inhabitants, including people who were sheltered within buildings as far as in Pompeii. The temperature was 250 to 300 degrees C, and the time of exposure was about 30 seconds or so. Death would have been during the first few seconds of that time. That temperature is enough to light gasoline and other fuels under certain conditions, but not enough to ignite clothing. So, now you know how they died. This post originally appeared on Greg Laden's Blog.